Just posting a pic. 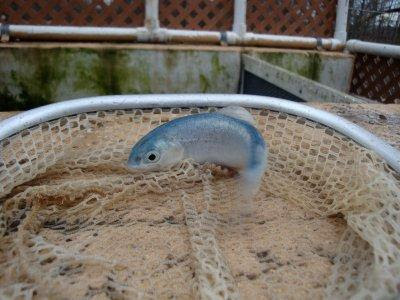 My trout club (the Stony Creek Anglers) has a blue trout at the nursery. They're pretty rare genetic mutation of a rainbow trout that gets it's color from a thyroid abnormality. Blue trout are infertile, so you can't intentionally breed them, it's luck of the draw.